Wow, it has been a long time since I blogged! Can't believe I've been away so long, but things have been hectic here. Two new babies in the family, two little boys to help care for as their mommy had a series of complications following baby's arrival, interviewing for a new job - things have been busy this fall. The upshot of it all is that I will be moving to a new job, effective 1/4/10! I will be working at a local community college as their Grants Administrator. Should be an interesting opportunity - a newly created position, so lots of trails to blaze. I made this skirt, which has an attractive back that you can't see in this drawing. 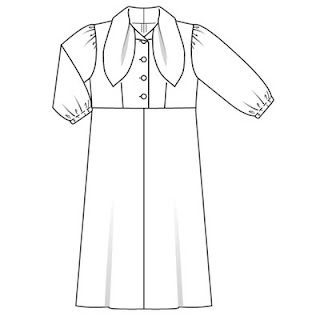 The bottom 1/3 is flared or draped. The rest of the skirt is a plain pencil skirt. I planned to make the jacket as well, but found I needed to adjust for larger bust and add to the arms - well by the time I got things worked out on paper - it just didn't seem as though it would fit. 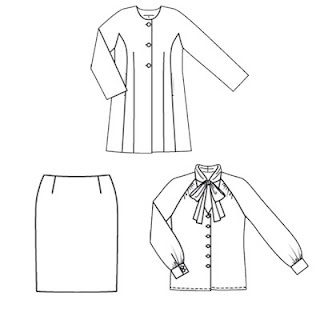 So that idea was abandoned and I plan to make a jacket from a Burda Pattern Company pattern. I made this dress in a heavy, nicely drapy poly. I added about 8 inches to the tie to make it a longer and floppier tie. I really love this dress, although it was a mistake a minute (sewing the two side seams together as the center back seam, etc.) I'll post a photo soon. AND I've been sewing and crocheting my Christmas presents - hats and scarves, shawls, pajamas, nightgowns, pullovers - lots of things. Still have a bit to go in the next week. Finally, my Cincinnati Five Crazy Quil group got together for the first time in months and months for a Christmas event. 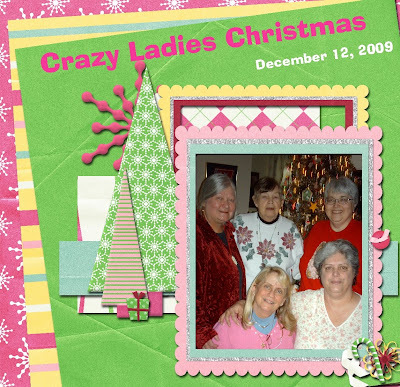 This is our photo below, with a digi-scrapbook frame. So have a Merry Christmas everyone, and a Happy New Year!!!!!! !